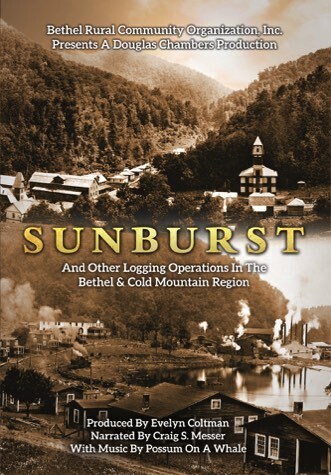 Sunburst and Other Logging Operations in the Bethel & Cold Mountain Region DVD revisits the early 20th Century logging operation on the West Fork of the Pigeon River that resulted in construction of Champion Paper and Fiber (now Evergreen Packaging), a company that has provided substantial employment opportunities for more than a century in Canton, North Carolina. Sunburst was one of the largest and most significant logging villages in the region, and its iconic name is emblematic of our romanticized recollection of lumber barons, lumberjacks, and logging camps that salted the mountains via a series of rail lines after the turn of the last century. Environmental anxiety resulted from the timber legacy, and, as a result, forest conservation also had its start at Sunburst. On the lighter side, a spirit of camaraderie centered around social activities, education, religion, small hotel and mercantile businesses, as well as a mingling of Caucasian and African American cultures in Sunburst Village. While the DVD may idealize the community spirit that enveloped those who resided at Sunburst, there is also recognition of the danger and difficulty of the lives of Sunburst residents who eked out a living in a harsh environment. While the DVD pays tribute to Sunburst and its history on the West Fork of the Pigeon River, focus also centers around logging efforts that preceded Sunburst as well as those that have continued to thrive in Bethel Community. The Powell family's five brothers and two sisters brought a hardwood lumber commercial enterprise to Haywood County with three base camps on the East Fork of the Pigeon River in the Cold Mountain region during the late 1920s just as the Sunburst operation ceased. The Powell family participated in lumber businesses for more than 100 years. Two major Powell lumber interests branched from that early assignment of bringing out hardwood lumber to be processed at factories further east that enabled North Carolina to become a premier state for furniture production. Today, two other wood products business in Bethel pay homage to their earlier historical roots: Appalachian Antique Hardwoods and BarkClad. Sponsors include the following: Carol Litchfield, Evergreen Packaging, Blue Rooster Southern Grill, Lake Logan Conference Center, Peak Dentistry, Nancy Armstrong/Jim Lynn, Evelyn and Richard Coltman, and Maria and Carroll Jones. The production is dedicated to the memory of Horace M. Green.